So a Blaze Designer Decides to Make a Meatloaf | What Goes with What? I made a meatloaf the other day from what might be called an old fashioned recipe that I found to be credited to the late fashion designer, Bill Blass. I have no idea where he got the recipe or why his name is attached. My guess; as a fashion designer Mr. Blass would have of course traveled to the clothing design capitals of the world and Paris would have been on that list and perhaps he discovered an interest in French. While one might consider this to be sort of “everyday” by today’s bold standards, I bet it would have been kind of “high line” calling for veal, for instance, in the 1980’s. My take; the meatloaf is more country French terrine in style with the inclusion of cooked vegetables, veal and the bacon topping, I added some chopped bacon to the meat mix for another layer of flavor right in line with the terrine concept. I was a bit underwhelmed with the first bite expecting a bit bigger flavor, but then I had another and another and realized that this was exactly as I should have expected, quite tasty. What I wasn’t expecting after a day in the fridge was that it had taken on a terrine like compact density, you can see what I mean in the photo and just like a terrine, had developed more flavor. It really turned into excellent meatloaf sandwich material which is what I make a meatloaf for in the first place. The sandwich phot includes the slices on a nice wheat bread with a slice of Swiss cheese buried under the lettuce, a little red onion and of course mayo, Best Foods is Hellman’s out here, don’t know why – and some Grey Poupon as a nod to the terrine flavors, yes I know I forgot the pickles. 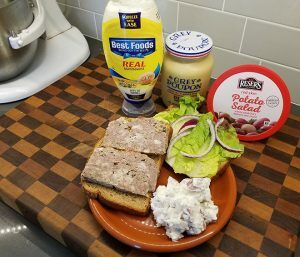 We enjoyed the Reser’s red skin potato salad in Chicago and were surprised to find them here, but come to find out that they are based in Oregon so they must be nationally distributed, a tad creamy but I can’t make it any better. I’m suggesting lighter reds with the meatloaf as there’s no predominate flavor that needs to be addressed by the wine choice; Beaujolais Villages, the gamy grape, and close cousin to Pinot Noir which will also work well if you go the mustard route or a lower alcohol Zinfandel. Raise a glass to Bill Blass who certainly knew his blazers – and apparently his meatloaf.